It may have taken until this month for Skinny Lister’s debut LP Forge and Flagon to be released in the United States, but this patriotic British Indie/Folk quintet has gone from an authentic pub band to the ‘hardest working band in the UK. And staying true to their debut album’s name, the band just continues to blow away crowds with their punky, effervescent folk hits that flow just like the everlasting quantity of wine from a metal flagon. In 2011, Skinny Lister played more festivals than ANY band in the UK, and don’t expect them to be slowed down by languor or travel hangovers. No, Skinny Lister will forge ahead with a vivaciousness unique to only the best of those perpetually touring acts. Why? Because they love it! 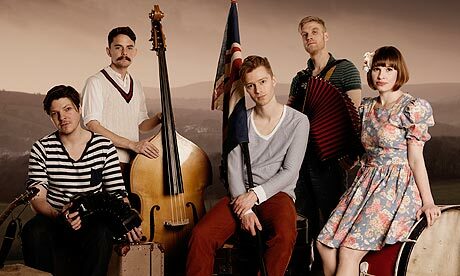 In 2012, Skinny Lister went from performing at SXSW to earning a spot on the Vans Warped Tour, where they played three times a day. To support their new release, the band is opening for California-spawned Celtic Punk band Flogging Molly during a 19-date tour that will traverse the States. I have the privilege to attend the NYC show, which I will do with much delight, and then with fervid enjoyment (like Skinny Lister’s musical attitude) write a review for you all. Check out the concert schedule. Let’s get to Skinny Lister’s debut. Often bands who are constantly touring fall into the trap of ‘studio lassitude.’ It’s almost a natural katzenjammer when one considers a restive tour schedule. This is NOT the case for Skinny Lister. The music is catchy, crisp, edgy, and excellent. The music is fresh. It is bubbly and brainy, smart and sassy, powerful and…well…powerful! The music is also ubiquitous. It can be enjoyed by those that like to dance, rock out, or just sit with a cup of joe and nod at good folk music. “Rollin’ Over” is an energetic piece fused with speedy percussion, spirited instrumentation, and fastidious harmony. From a musical standpoint it is tightly spun, a perfect example of punk-infused folk-pop, but from a pure enjoyment standpoint the music is playful and sprightly. It is almost a guarantee that large groups of audiences will repeat “roll back to your side” ad nauseam. The additional vocal harmony at the end is much appreciated. Great track. “If the Gaff Don’t Let us Down” moves in a similar manner, but it plays more like a tame Flogging Molly or Great Big Sea track. It is an ode to England, and the lyric attests to that fact. This should be added to the British tourism board. It is a sea jig with the best of them, and it makes me want a London Pride in a pub overlooking the river Mersey. I can’t stress this enough, drink in Skinny Lister. You will be hearing a lot more about them in the upcoming weeks and months.